Plagiarism is defined in dictionaries as the "wrongful appropriation," "close imitation," or "purloining and publication" of another author's "language, thoughts, ideas, or expressions," and the representation of them as one's own original work, but the notion remains problematic with nebulous boundaries. The modern concept of plagiarism as immoral and originality as an ideal emerged in Europe only in the 18th century, particularly with the Romantic movement, while in the previous centuries authors and artists were encouraged to "copy the masters as closely as possible" and avoid "unnecessary invention. Do you follow the rule of thumb "90% familiar, 10% fresh"? When you look at the game you are working on is there a direct comparable? Do your designers say "For that feature let's model how X did it" and consistently refer to the same pre-existing game? Is your primary reference a game considered original or innovative in the last 3-5 years? Is your primary philosophy of design "I could totally make a better version of game X"
Do you copy mechanics and assume that adding different content such as levels or graphics makes your game unique? If you follow these patterns, you are likely a plagiarist. To rewrite the industry's golden rule in the language of other arts, "90% is plagiarized and 10% is remixed to give the illusion that the player is engaged in an original work." This lazy and morally offensive practice has become a social norm within our incestuous industry. We don't even consider that there might be alternative method of developing games. We are the equivalent of the western world before the suffrage movement. Or the South before the civil rights movement. We look at our current derivative behavior, acknowledge that it is harmful and then proceed to dogmatically justify its continued pursuit based off economic, legal, historical and short-term selfish reasons. Yet the fact that 'everyone does it' fails to provide a strong moral foundation for an act that diminishes our industry and damages the minority that strive to create original works. It is a common practice to include individual mechanics inspired by previous games. This is a natural part of the creative process. Plagiarists, however borrows systems en mass. They takes not just the movement mechanic from Zelda, but the flow of the dungeons, the majority of the power ups, and the millisecond by millisecond feel of the game. Game designs are very close to a mechanical invention. The rules, interface and feedback systems all create a reproducible set of player dynamics. Think of a game as an invented 'fun engine' that when placed in front of a player yields delight and mastery. Developers go through a few stages of invention when building games. Copying a design. Most programmers make a simple copy of an existing functional game as part of their learning process. You copy everything including interface, levels, scoring and more. You don't understand why the game works so you replicate it in the hopes of blindly capturing the magic. You may change out the art, but otherwise it is the same game. Modifying an existing design. Usually this involves just playing with existing parameters or content. You might add a a triple shotgun and new levels to your Doom-clone. You still don't understand the game, but you can play with safe variables like narrative, level design or theme that are unlikely to ruin the value of the core mechanic. Warcraft is a classic example of a modification of the original Dune 2 RTS design. Adding to a design. Taking the core fun engine and add something to it. Think of this as adding a turbo charger on an existing car. Sonic took Mario and made the main character much faster. In the best games this results in a cascade effect throughout the entire design that requires you to rethink content, pacing, scoring and more. Synthesizing a new design. Take multiple disparate parts and put together a new game that has unique dynamics. A game like PuzzleJuice is a great example of a synthesized design that takes elements from Tetris and Boggle. To many players, it feels like a brand new games built out of familiar pieces. Inventing a design. Using a variety of sources of inspiration, create a new fun engine that is unique and new to the world. The early stages of copying are an essential process that all students of game design should undertake. As a learning activity, there isn't a lot of money in creating master studies, but it is a respectable pursuit along the path to self improvement. As long as students cite their inspiration and refrain from competing directly with the original creator there is little conflict. The later stages of invention are risky, difficult work. There's an immense amount of experimentation and failure. Even the simplest game inventions (such as Tetris or Lemmings) were the result of years of diligent labor by master designers. There aren't a lot of these people, yet they bring immense amounts of joy to the world. They deserve to profit from their inventions and in general players are excited to spend their money on new, delightful games. The plagiarist is someone who wants to shortcut the process of invention. They decide that it is cheaper to copy as much a possible so that the dynamics of a previous game are preserved. Then cosmetic tweaks are applied and the copy is sold as a new thing by an original creator. Changing out the graphics or giving the game a new plot are the most common tweaks because they are easily decoupled without damaging the delicate dynamics of play. When you look at the games released on the market, you can easily see that there is a spectrum of theft. The most blatant plagiarists are those that steal the most and innovate new mechanics and dynamics the least. By cheaply creating games without needing to pay the cost of research and invention, plagiarists are able to quickly release games into markets that the original innovator has not fully addressed. Clones therefore capture value that would have otherwise eventually accrued to the original innovator. For example, clones of Minecraft that reach XBLA earlier tap unmet demand and reduce the audience for Minecraft when it eventually releases there. On first blush, consumer advocates might imagine that this is a fine situation. They get a product they like faster and as the population of plagiarists merrily plagiarize one another, you end up with an explosion of quality choices. Consider how this effects the original source of the innovation. While the overall market may be larger, the original innovator is left naked with no protection that lets them recoup the cost of the initial invention. There are few legal protections for game inventors. There is only the stark reality that many smaller independent developers, the life blood of innovation in our current markets, are blindsided by a blast of competition that they lack the development resources, distribution agreements or business expertise to successfully compete against. The plagiarists capture the majority of the market, establish well known evergreen brands and the original innovators are at best a footnote. As a result of this tragically common feedback loop, those inclined to innovate are discouraged from innovating in the first place. Why innovate when it costs you money and doesn't yield the competitive advantage you might hope due to the nearly instantaneous influx of copy-cat competitors? It may look like a better business option to simply join the plagiarists and avoid the whole expensive innovation thing in the first place. It is no surprise that the game industry tends to have a large number of evolutionary works, but fewer genre-busting founder works. The plagiarist's 'make a buck at any cost' attitude directly results in a creatively stagnant industry long term. You don't need to look far to see concrete examples of these dynamics in action. Note how quickly the cartoonishly mercenary plagiarism-focused culture of social games turned a bright spot of burgeoning innovation into an endless red ocean of clone after clone within a mere handful of years. Such a wasteland fails to grow the market and ultimately leads to less consumer choice. 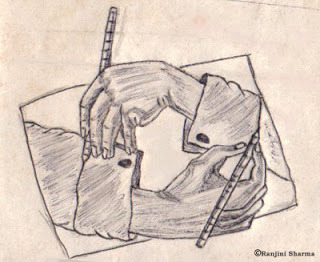 There is of course skill in plagiarizing well, just as there is skill in forging a famous painting. To be a professional plagiarist is laborious work. I acknowledge this. We've developed a whole subculture of designers that specialize in the subtle arts of copying the work of others. A 'good designer' is one that excels at 'researching comparable games'. They steal with great care from only the best. They also excel at 'polish' which has been warped to mean the skill at reverse engineering a comparable game so that the copy feels identical down to the smallest detail. The current industry put such skills on a pedestal. We hire for them and we pay top dollar for reliable execution. Yet at best, these are the skills of a journeyman, mechanically copying the master works of past giants. If you stick to doing only this, there's a pretty clear career path. You end up as a wage slave. Typically such laborers are hired by businesses that couldn't give a damn about pushing the craft of game design forward. Instead, the goal is another product for another slot on either the retail shelf or the downloadable dashboard. Grind it out, worker bee. If you can copy a past hit by the flickering candle of midnight crunch, your family gets its ball of rice for the day. This is the entirety of your creative worth. If you go to sleep each night thinking "I'm a hack, but at least I pay the bills", you deserve pity. And you need to contemplate the quiet whisper that maybe you don't need to spend your entire career diligently copying others. Remember when you were a sparklingly original creative person? Remember when you wanted to change the world? Remember that time before you compromised? We live in an economic world. Yes, you need to eat. We also live in a legal world. There is a rather low minimum bar for our behavior. But as creators and artists, we can each choose where we put our creative energy. What we create has a moral and emotional component that is perhaps more important for both our mental health than any paycheck. To be a plagiarist and to stay a plagiarist is to waste your very limited time on this planet. What amazing things could you be making if you didn't spend so much time slavishly copying others? What's the alternative? Why not start up a small prototyping project? Knock a genre down to its most basic element. Give yourself constraints so you intentionally do not replicate games of the past. Rebuild your game from that simple foundation, borrowing elements from the entire breadth of game history. Finish a game that has a half dozen influences from widely disparate games that in the end create a player experience that is uniquely yours. This is how you stop being a plagiarist and start becoming a master game designer. There is still time to create something amazing and new.